There has been a modest increase over the past two years in the percentage of Americans who say there is solid evidence of global warming, although substantially fewer Americans say there is solid evidence of global warming than did so from 2006 to 2008. Currently, 63% say there is solid evidence that that the earth’s average temperature has been getting warmer over the past few decades. In October 2009, 57% expressed this view. 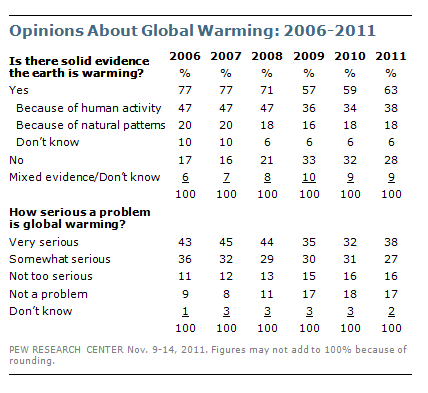 During 2006 to 2008, more than seven-in-ten Americans believed there was solid evidence of global warming. The number saying global warming is a very serious problem also has ticked up — to 38% currently from 32% last year; 35% said this in 2009. However, fewer Americans hold that view than they did during 2006 to 2008. Read the full report for more information about the large partisan and ideological gap on the question of the existence of global warming.